Thousands of lives have been lost in the tragic incident of cloud burst and landslide in the hill state of Uttarakhand in India. The government agencies and the Indian Army have been carrying out rescue operations to save human lives which is commendable. However, no one is paying attention to nearly 2000 mules and horses stranded in the ravaged area. These mules are used to ferry people from one place to another in the hills which itself is animal torture and exploitation. 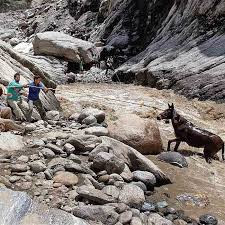 However, ignoring them completely and leaving them to die of starvation after a calamity of such magnitude shows our indifferent and cruel attitude towards these animals. It proves how rampantly we have exploited the Earth and its creatures for our own benefit. The lives of these starving animals are as important as of humans. Nobody has a right to think that animals have fewer rights than humans and that it does not matter if these mules and horses starve to death. The government and the authorities concerned should immediately start a rescue and rehabilitation program for these animals. In the meantime, they should immediately be provided with food and water. A team of vets should be sent immediately to ascertain that all the injured animals are given proper medical treatment. If we have been exploiting these animals for our own benefit, we must take care of them. We must remember that the life of an animals is as precious as the life of a human being and that they deserve the same facilities which are being provided to the humans of the affected area. We request the government to immediately take staeps to rescue and rehabilitate these innocent animals.